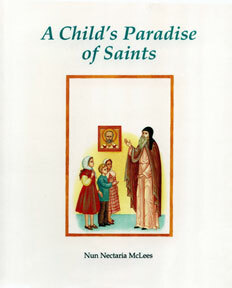 Delightful tales of 15 cherished saints, with iconographic full-color paintings of scenes from their lives. Delightful tales of 15 cherished saints, with iconographic full-color paintings of scenes from their lives. Here you’ll find stories from the lives of Saints Constantine and Helen, Cyprian and Justina, Demetrius of Thessalonica, Herman of Alaska, John the Russian, Mary Magdalene, Mary of Egypt Moses the Black, Nicholas the Wonderworker, Nina of Georgia, Great Martyr Panteleimon, Philothei of Athens, Seraphim of Sarov and Xenia of Petersburg, as well as the Guardian Angel.